Teaser Tuesday is a weekly bookish meme hosted by The Purple Booker. If you want to join in grab your current read, flick to a random page, select two sentences (without spoilers) and share them in a blog post or in the comments of The Purple Booker. 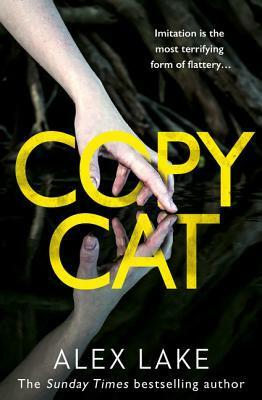 This week my teaser comes from Copycat by Alex Lake, a book I had to put on the back burner while I caught up on ARCs but have finally managed to pick up again. I actually won this in a GoodReads giveaway. It’s a psychological thriller about a woman who someone has it in for. They set up a fake facebook profile in her name, send emails claiming to be from her…. It’s pretty creepy and does make you a bit paranoid about your online presence. There was a strange paradox at the heart of it: she felt totally comfortable with him, trusted he loved her whatever she did, yet at the same time she still wanted to impress him, still wanted to show him she was a strong and intelligent and beautiful woman who merited his ongoing love and attention. She didn’t resent the feeling, because she didn’t think she had to do it. But the real problem is that your stalker is you. Sarah Havenant discovers–when an old friend points it out–that there are two Facebook profiles in her name. One, she recognizes: it is hers. The other, she has never seen. But everything in it is accurate. Recent photos of her and her friends, her and her husband, her and her kids. Even of her new kitchen. A photo taken inside her house. She is bemused, angry, and worried. Who was able to do this? Any why? Ooh yes I enjoy books about stalkers! Ooh, I am now hooked on the idea of this one. Can’t wait to get it! Thanks for sharing, and for visiting my blog. *shivers while looking nervously at the computer screen* And now I’m thinking I should close down my Facebook pages and take up knitting… a really creepy premise! I always enjoy a good stalker thriller!